The average Seattle-area home is selling for below list price for the first time in four years. Buyers are now more likely to avoid bidding wars and the dangers that come with them. For the first time in four years, the average house sells for a bit below the listing price in Seattle and across the surrounding metro area, another sign that a hectic market has finally calmed down for burned-out buyers. In most of the country, it’s normal, and even expected, for buyers to negotiate the list price down. But this is Seattle, a place where the asking price had become merely a starting point destined to be bid up. 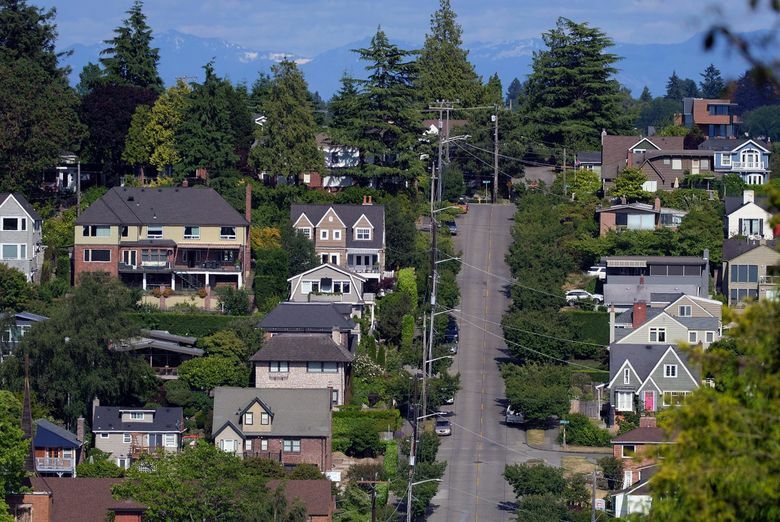 As recently as May – a time now seen, in hindsight, as perhaps the peak of the market – homes in Seattle were selling on average for 6.3 percent above the list price, according to Redfin. Now, they’re going for 0.6 percent below asking. In fact, just in the past month, Seattle-area home prices dropped more than anywhere else in the country, according to the new Case-Shiller home price index released Tuesday. The index showed the region’s largest monthly drop in home prices since the late stages of the housing bust. The drop in competition level, driven by a weakened buyer pool, has changed the way people shop and bid on homes. Buyers are now more likely to avoid bidding wars and the dangers that come with them, like fast-paced deals and waiving inspections, which had become standard in recent years. Homes are selling in about 17 days on average now, up from 10 days at this point a year ago, Redfin said. Before, savvy homebuyers had come to search for listings below their price range in expectation that they would have to offer more to beat other bidders. And for inexperienced buyers, it wasn’t uncommon to fall in love with a house listed in their budget only to watch in frustration as it got bid up into the stratosphere. It’s a similar, if slightly less dramatic, story across the broader metro area: The typical home from Tacoma to Everett now goes for 0.4 percent below list price, down from the spring peak when homes went for 4.6 percent above asking. It’s important to note that Seattle is only dropping back down toward what a normal market looks like. Among the nation’s 50 biggest cities, the average home sells above list price in only five of them. More signs of the market cooling came Tuesday with the monthly release of the nationwide Case-Shiller home price index – which Seattle’s price increases had led for nearly two years before being dethroned this summer by Las Vegas. The index shows single-family home prices across the metro area fell 1.6 percent in August on a month-over-month basis, the biggest drop in the country. The last time the index showed prices dropping that much on a month-over-month basis was 2011, when the region was in the final stages of the housing collapse. 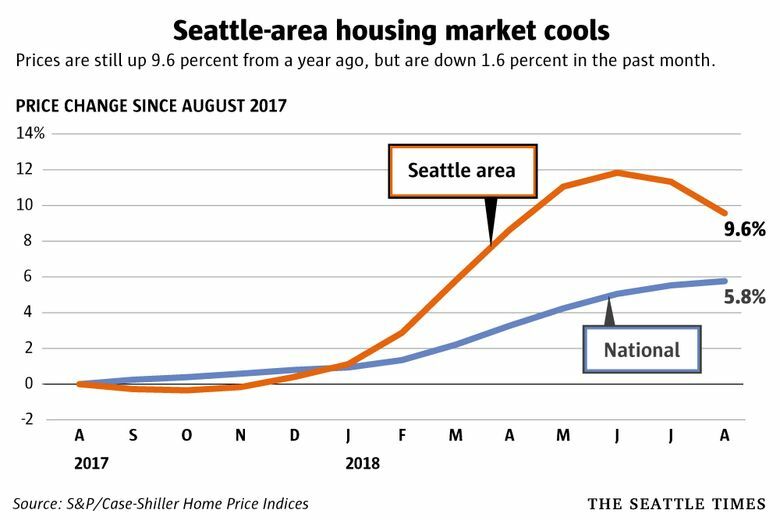 On a year-over-year basis, prices in Greater Seattle still grew 9.6 percent, but that pace is the lowest in three years. The increase was again driven largely by demand for the cheapest homes in the region, which are mostly in Pierce County and north Snohomish County. For the previous 31 months, the Seattle region’s year-over-year home-price growth was consistently in double digits. San Francisco joined Las Vegas in surpassing Seattle on the list of regions with the biggest year-over-year increase in home prices. The last time Seattle was outside the top two hottest markets was late 2015. Nationally, home prices were up 5.8 percent in August, down from a peak of 6.5 percent earlier this year. The most recent numbers show the median house costs $668,000 in King County, $485,000 in Snohomish County and $353,000 in Pierce County. Read more about real estate here and on the Homes page.